Read more details about St. Mark's School on their 2018-19 profile page. Activities During Boarding School I played Varsity Field Hockey, Varsity Ice Hockey, and Varsity Softball for all 4 years at St. Mark's. I captained the Field Hockey and Ice Hockey teams my Fifth Form (junior) year and captained all 3 my Sixth Form (senior) year. I was also a Monitor my last year at St. Mark's. Monitors are the eight sixth form representatives to the student and faculty elected each year. They meet with the Head of School, Dean of Res, Dean of Students, and an advisor on a weekly basis, meet on their own time, and run the two weekly All School Meetings every Wednesday and Saturday. I was also on multiple school review committees. I think that the school under one roof concept that St. Mark's embodies is essential to understanding the essence of the St. Mark's experience. Under the roof of the main building of the school, classrooms, library, student center, dining hall, and most dormitories reside. There is nothing better than being able to move within one building to each class while also keeping all students in the same general area during the class day. Having this at St. Mark's contributes to the community in which people feed off of each other's energy. This is illustrated best in the weekly school meetings held in the Forbes Center every Wednesday and Saturday where both students and faculty can address the entire community. I had many academic and athletic achievements that followed my hard work in my time at St. Mark's. I grew to realize who I was as person then and who I want to become. It is easy to just go through the motions of highschool, but if you actually give it all you've got, no one can stop you. And that's what I did; from school work to athletics to friends, I did all I could do. Throw yourself into the school. There are so many different opportunities to take advantage of. Don't worry about fitting in with anyone because honestly, no one fits in. Everyone is different and that what makes the boarding school experience cool. The learning process doesn't just stop once you leave the classroom. Students are constantly learning about different cultures and relationship skills. I liked the relationships that I formed with the people I care most about, teachers and peers alike. I will not be forgetting about any memories any time soon. Enjoy Your Time. Get involved in every aspect of the School. St. Mark's is whatever you make it to be, so take advantage of it. My favorite part of the academics at St. Mark's was the group collaboration and the reliance on group discussions. This is best illustrated in the presence of the Harkness Tables in many English, History, Language, and Religion classes at St. Mark's. The teachers are all very passionate about their subject and are more than willing to meet with students outside of the classroom. The workload is very manageable as long as one stays on top of their work and establishes a great relationship with their teachers. Although the girl's teams at St. Mark's weren't always the most competitive in the ISL, each of my teams was family. I made my best friends on these teams and I built my character learning how to lead them as their captain. My coach for two of my sports was also my academic advisor and I can not say enough good things about her. She not only was there for me whenever I needed a laugh or just to talk about anything, she taught me all she knew about each sport with much enthusiasm, which ended up carrying over into my playing. My relationships with every member of my teams, including my coaches, are ones that I will forever be grateful for and cherish. I never did participate in any of the Music or Visual Arts at St. Mark's but each semester I did attend the concerts that the students put on or the seasonal play that was happening. All I can say is that the effort that was put into those plays and music lessons was not wasted. They never ceased to amaze me. 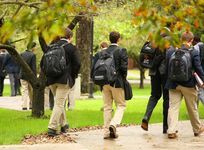 Though clubs do exist at St. Mark's, the hectic daily schedule of the typical St. Marker rarely left time for these clubs to meet. The Green Team is probably the most prominent club on campus as they sponsor the Earth Day festivities and other events scattered throughout the year. I was a day student at St. Mark's for all four years, but that certainly does not mean that I was not a part of dorm life. I was named an Honorary Member of the Gaccon Girl's Dorm and spent much of my time from 9:30 pm on in the dorm rooms of all my friends. At no moment did I ever feel excluded from dorm life or activities as the Day Student dorm Burnett House held their own events while I was also included in the Gaccon and Thayer Dorm Activities. I like the options at the dining hall for every meal. Although I was a day student, I did eat all three meals at school and I felt that most days there was something nutritious for me to eat. Two times a week we had seated meal for lunch where there would be assigned seats and the food is served to you. Other than that, the dining hall is free seating every meal of every day. Plus if you don't like what is being served for a meal, call up Domino's Pizza or Panda House and they won't let you down. St. Mark's is located in the rural town of Southborough, Massachusetts. This is such a pretty town that has a great relationship with our school. I may be biased as I grew up in the next town over, but I feel that the location is perfect for a boarding school. Only a short ride from the city of Boston, but secluded enough to maintain student life on campus during the weekends. Route 9 is right down the road from St. Mark's and is filled with stores and restaurants. It is not uncommon for teachers or advisors to take groups of students to the local Starbucks or Coldstones for a little treat. The school does a great job of incorporating weekend activities into Student Life at St. Mark's. More than not there is a dance on a Saturday night or a movie showing in the Performance Hall or Broomball on the Ice Rink. Either way, students are eager to interact with each other. And on those nights when there isn't much going on at St. Mark's, that doesn't stop St. Markers from making their own fun.